The democratic, ubiquitous, and graphic nature of the print medium has made it a potent tool for political change. 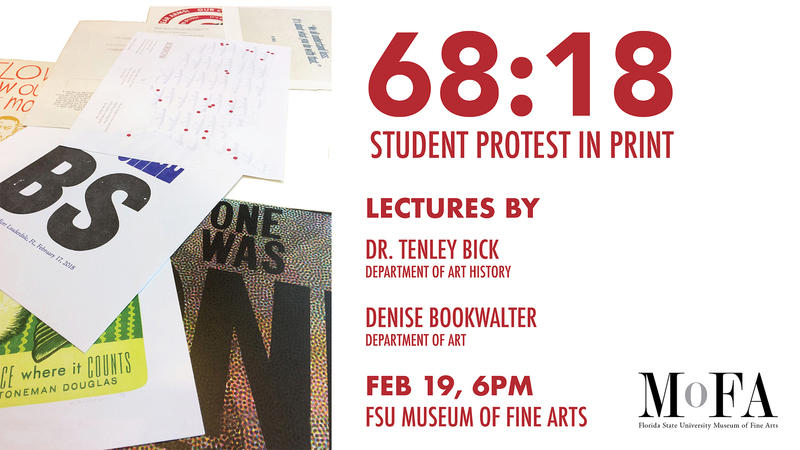 In February and March, the Museum of Fine Arts is hosting an exhibition of prints associated with the student protests of Paris in 1968 and Florida in 2018. In the spring of May 1968, group of French students began an occupation which would grow to be one of the largest demonstrations in modern history. Striking workers and protesters brought Paris to a halt, and the posters and graffiti that amplified their message have become part of our visual vernacular. With original artwork that was posted on the streets of Paris fifty years ago and contemporary prints influenced by current student led gun violence protests, this exhibition explores the role of graphic art in political organizing. Dr. Bick is a scholar of global modern and contemporary art, with a focus on post World War II Europe. She has published extensively on cultural art history and the geopolitics of the 1960s and is currently teaching a graduate seminar on the decade. Professor Bookwalter teaches printmaking and book arts in the Department of Art and is the Director of the Small Craft Advisory Press. The print exchange Enough is Enough and her broadside responding to the student-led anti-gun protests of 2018 is included in the exhibition.